One of the "drawbacks" of traveling to Las Vegas is the sheer wealth of choices on where to stay. Visitors need to decide whether to stay "On the Las Vegas Strip," in some of the big casino's away from the Strip, or in a simple non-gambling hotel like a Hampton Inn. Since most travel sites promote Las Vegas Strip hotels exclusively, I thought it would be helpful to provide a list and information about all the hotels in Las Vegas that are NOT on the Las Vegas Strip and also are not located in the popular Fremont Street section of town. It's my hope that anyone simply passing through Las Vegas might find this page useful and helpful. 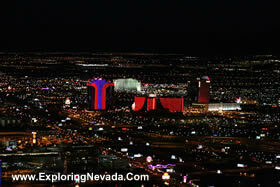 Below are the varoius hotels and casino's that are not located on either the Las Vegas Strip or Fremont Street. To see the listings and information about these other hotels, visit the Las Vegas Strip Hotels or the Fremont Street Hotels pages of this site.